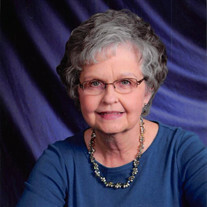 Martha Beatrice Laws, 73, of Hannibal, Mo. passed away at 6:00 p.m. Thursday, October 6, 2016, at her home. Funeral services will be held 10:00 a.m. Monday, October 10, 2016, at Immanuel Baptist Church in Hannibal. Pastor Mark Albee will officiate. Graveside service and burial will be held 4:00 p.m. Monday at the Masonic Cemetery in Farmington, Mo. Visitation will be held 5:00 to 8:00 p.m. Sunday, October 9, 2016, at Immanuel Baptist Church. Martha was born on August 20, 1943, in Fredericktown, Mo. the daughter of Lester Clarence and Edna Pearl (Young) Ragsdale. She was married to Thomas D. Laws on August 3, 1962, in Farmington, Mo. He preceded her in death on November 12, 2001. Survivors include one son, Steven Laws and wife Trudy of Hannibal, Mo; one daughter, Mary Ellen McDowell and husband Jason of Jacksonville, Ill; one sister, Leslie June Horn of St. Louis, Mo. ; four grandchildren, Clayton McDowell, Carter McDowell, Abigail Laws and Hannah Laws, sister-in-law and brother-in-law, Jennie and Gary Bertram of Farmington, Mo. ; three nephews, Josh and Ryan Bertram, and John Ragsdale; and two nieces, Ellen Horn and Linda Schriever. In addition to her parents and husband, Mrs. Laws was preceded in death by a brother, John William Ragsdale, one nephew, Michael Ragsdale, and one brother-in-law, Firmin Horn. Martha graduated from Farmington High School in 1961. She went on to further her education at Flat River Junior College. Martha served as the church secretary for many years at Immanuel Baptist Church. She was very dedicated and committed to serving her church. Martha could be found playing the piano on Sunday mornings at Immanuel along with assisting in teaching the Ladies Sunday School Class and serving the home bound. Most recently Martha was joined by her granddaughters' musical talents during worship services at church. Martha enjoyed spending time with her family and friends. She especially cherished every moment with her grandchildren. Her family enjoyed her cooking talents, especially her homemade cinnamon rolls. Martha also enjoyed her animals and doing puzzles and she was an avid reader. Pallbearers will be Josh Bertram, Ryan Bertram, Daron Caswell, Rich Gibson, Gary Taylor, Bill Bouyea, Michael Schriever, and Danny Gibbons. Honorary Pallbearers will be Gary Bertram, Tom Sutton, Nick Boltz, and David Berry. Memorial contributions may be made to Immanuel Baptist Church, in care of the Smith Funeral Home and Chapel.